Apple’s chief executive, Timothy D. Cook, took the unusual step Monday of apologizing to Chinese customers over the company’s warranty policy and said he would improve customer service in the country. 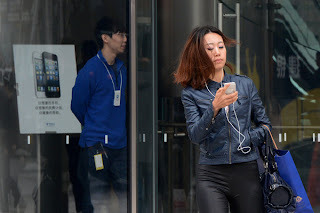 Apple’s problem began on International Consumers’ Day, when China’s biggest state-run television network, as is its tradition, broadcast an investigative report on how companies operating in China cheat or mistreat consumers. This year, on March 15, one of the targets was Apple. Apple did not immediately respond to some of the accusations, but other state media outlets stepped up their criticism over the next two weeks, raising the stakes for Apple in China, which is now the company’s second-biggest market after the United States. Soon after the segment was broadcast, several Chinese celebrities piled on, posting harsh comments on Weibo, China’s Twitter-like service. Other state organs also joined the fray. China’s State Administration of Industry and Commerce, which has oversight of business practices in China, called for “strengthened supervision” of Apple. And in recent days, television news broadcasts have included images of Chinese journalists being turned away from Apple’s offices in China. Some media analysts and bloggers have called the media frenzy over Apple’s warranty policies bizarre because of the ferocity of it. Other analysts speculate that the continuing media blitz against Apple is aimed at showing what the government can do to American technology giants, even those as successful as Apple. The criticism of Apple coincides with the Obama administration’s pressure on Beijing on cybersecurity issues. A growing number of American companies have complained about computer hacking attacks that seemed to be originating in China. And earlier this year, several members of Congress moved to restrict two of China’s biggest telecommunications equipment makers, Huawei and ZTE, from doing business in the United States because of concerns that they could engage in espionage. Sprint Nextel and SoftBank, its Japanese suitor, are expected to enter an agreement with American law enforcement officials to allay such national security concerns. It will restrict the combined company’s ability to pick suppliers for its telecom equipment and systems, like Huawei and ZTE. Bill Bishop, a Beijing technology analyst and publisher of the online newsletter Sinocism China, said it was difficult to know what prompted the investigation by the state media, but he noted that Apple’s explosive growth in China might have outpaced the company’s ability to fully train and prepare its work force and management team to deal with the challenges of the Chinese market. Anna Han, an associate professor of law at Santa Clara University, said Mr. Cook’s letter of apology was a smart tactic and a “very Chinese thing to do.” She compared it with public apologies that plaintiffs will sometimes ask for from defendants in Chinese courts. That action, combined with the change in its warranty policy, “sort of takes the wind out of the government’s sails,” said Ms. Han, who advises American companies doing business in China. Ms. Han said it was possible that the Chinese state media were taking an aggressive approach toward Apple in part to help Chinese companies that could compete more closely with Apple over time, like ZTE. While past attacks on Western companies have been related to food and drug safety issues, she said the Apple warranty issues were relatively minor, suggesting they were motivated by a form of protectionism. Apple has been riding a wave of popularity in China with revenue reaching $20 billion during the last year. In its most recently reported quarter, sales in China were about 13 percent of the company’s total sales, up from 9 percent a year earlier. Apple has occasionally apologized or made policy changes when controversies in the United States over its products have erupted, even in cases where the company felt the issues were blown out of proportion.